B & H Engineering, P.C. has performed 2009-2010 biennial inspection of 630 structures (1800 spans) in the Bronx county, as a prime consultant, for the NYSDOT. Services included: field inspections, load rating of bridges, quality assurance on flag reports, reporting of flagged conditions to NYSDOT, design and preparation of repair details for prompt immediate action conditions; preparation of final reports and submission electronically; load rating of bridges using VIRTIS software, disposition of flagged conditions, planning and scheduling inspection; coordinating inspection with ongoing construction contracts and railroads; providing and monitoring Maintenance and Protection of Traffic on the Bridges, Local Streets, Expressways, Parkways and Railroads. 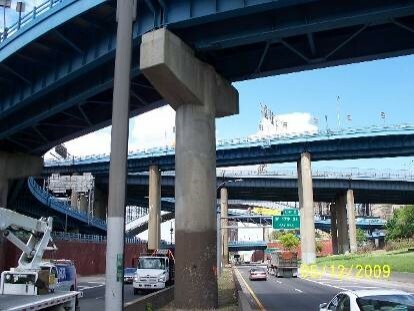 Assignment included inspection of such structures as the Cross Bronx Expressway, Major Deegan Expressway, Bruckner Expressway, Bronx River Parkway, Hutchinson River Parkway, Henry Hudson Parkway and Mosholu Parkway. Inspection was performed utilizing a mobile field office. Inspection equipment included 30 to 130 feet men lifts, bucket trucks, under bridge inspection unit (UBI), Moog inspection truck, boats (where required) and ladders.